This name uses Spanish naming customs: the first or paternal family name is Cruz. 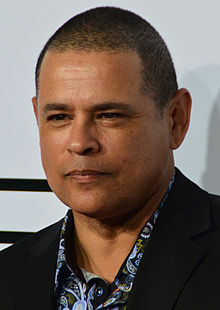 Raymond Cruz (born July 9, 1961) is an American actor, best known for his starring role as Detective Julio Sanchez in the series The Closer and his recurring role as the drug lord Tuco Salamanca in the crime drama Breaking Bad and its spin-off Better Call Saul. He also starred on the series Major Crimes, a spinoff of The Closer, reprising the role of Sanchez. Cruz was born in Los Angeles, and attended East Los Angeles College. Of Mexican descent, he grew up in a neighborhood that regularly saw gang activity, a reality he brings to his roles, particularly as Julio Sanchez on The Closer and Major Crimes, as well as a range of gang-affiliated characters. Cruz has said that becoming interested in American literature early in life helped him avoid joining such gangs himself. His film roles include Ding Chavez in Clear and Present Danger, Hector in "Out For Justice", Tom Berenger's second-in-command Joey Six in The Substitute, U.S. Marine Sergeant Rojas in The Rock, as Jesus in From Dusk Till Dawn 2: Texas Blood Money, USM Private Vincent DiStephano in Alien: Resurrection, and Ramirez in Under Siege. He appeared as Chuey, a gang member from the Vatos Locos, in the gang film Blood In Blood Out. In 2005, he played Chino in Havoc. He appeared in Gremlins 2: The New Batch, credited as "The Messenger," and in Training Day as a gang member named Sniper. He played a Los Angeles firefighter in Collateral Damage. He had guest roles in the Star Trek: Deep Space Nine episode "The Siege of AR-558", the X-Files episode "El Mundo Gira", and the second season of 24. He also made an appearance as the father of a murdered girl in CSI. He played a short-lived but well-known role as Tuco Salamanca, a sadistic and sociopathic meth dealer in Breaking Bad in 2008 and 2009. He later reprised the role of Tuco in the Breaking Bad spin-off, Better Call Saul. He had a recurring role as Paco on My Name Is Earl, and as Alejandro Perez on Nip/Tuck. 1988 Beauty and the Beast Hal Episode: "Down to a Sunless Sea"
1988 Cagney and Lacey Alonzo Episode: "Land of the Free"
1988 CBS Schoolbreak Special Angel Perez Episode: "Gangs"
1988 Vietnam War Story Diaz Episode: "Separated"
1990 Hunter Tomas Delgado Episode: "La Familia"
1990 Freddy's Nightmares Johnny 'Mac' McFarland Episode: "Life Sentence"
1990 Matlock Alien Worker Episode: "The Cookie Monster"
1990 Lifestories Episode: "Frank Brody"
1990 China Beach Lopez Episode: "One Small Step"
1993 Murder, She Wrote José "Joseph" Galvan Episode: "Double Jeopardy"
1995 The Marshal Rossiter Episode: "The Ballad of Lucas Burke"
1995 Walker Texas Ranger Sgt. Perez Episode: "Case Closed"
1997 The X Files Eladio Buente Episode: "El Mundo Gira"
1997 Cracker: Mind Over Murder MacCormick Episode: "'Tis Pity She's a Whore"
1997 413 Hope St. Rico Episode: "Lost Boys and Gothic Girls"
1998 Star Trek: Deep Space Nine Vargas Episode: "The Siege of AR-558"
1998 The Practice Miguel Moreno Episode: "Truth and Consequences"
1999 Seven Days Rodriguez Episode: "Daddy's Girl"
2000 Strange World Rinaldo Molina Episode: "Man Plus"
2000 Seven Days Teo Millar Episode: "The Cuban Missile"
2002 Robbery Homicide Division Jesus "Termite" Rosales Episode: "City of Strivers"
2002 Boomtown Ruben Episode: "Crash"
2012 White Collar Enrico Morales Episode: "Most Wanted"
2016 The Eric Andre Show Himself Episode: "Raymond Cruz; Amber Rose"
^ "TNT Says Goodbye to The Closer, Hello to Major Crimes". TV Guide. August 12, 2012. Retrieved October 19, 2012. ^ Profile, esquire.com; accessed July 16, 2015. ^ Fontana, Christine. "Cruz Control". ^ Cruz on avoiding gangs, thedailybeast.com; February 11, 2015; accessed July 16, 2015.